Thank you for your helpful tips on photographing and presenting the photos for your inspection. Hope the attached photos are good for viewing and downloading. Bought by my dad at J.B. Hudson Jewelers, a high-end store, in downtown St. Paul, Minnesota. My mom remembers receiving it “before kids” in the mid-late 1950’s. She thinks there is a photo of her wearing it from that time. She reports that broke it cleaning it, and had it restrung by the same dealer. Looks like a strong “tigertail” cord with silver findings to match. she does not remember what it orginally was strung on. All the same beads were used in the restringing repair. Appears to be Sterling Silver, but no stamp indicating that. Pendant: 5.5 cm in diameter at widest (2 1/4″). Heavy sterling silver for sure. Feels heavy. Some signs of wear. Mom didn’t wear it that often. Designer hallmark on back – Can’t find a similar one in my research. Unknown. Hope you can make it out! Though simple and less ornate than others I’ve seen, it it quite striking to me. Like a sculpture in miniature. Nice job on the photos and very nice necklace ! I have no information on a LAVOI or anything close to that. I’d say this is a Navajo piece, not Zuni. The beads appear to be bench-made round and melon beads. The Naja looks very shiny for 60+ years old – perhaps it has been polished? Sometimes when someone is preparing a piece like this for sale, the seller is tempted to polish the item but that actually decreases the value. The patina adds to its appeal. To me is seems like the naja pendant now looks quite a different color than the beads. Is that how they look in person? Usually its best to leave the patina on a vintage item when you are selling and let the new owner decide if they want to leave it as is or polish it. Squash, corn and beans are important foods for the Native American people of the US southwest. 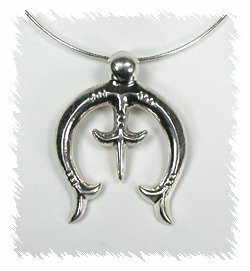 They are often used in a symbolic way in jewelry and ceremonies. Some say the Navajo squash blossom necklace has a connection to southwestern agriculture, other say the the spread petal design is just that, a design, and that is was only after white man asked, “what is this, what does it mean” did the name squash blossom come to be. Yet others say the Navajo copied a similar Spanish design of the pomegranate – look at the end of the pomegranate below and compare it to the “squash blossom” bead. The Navajo word for the “squash blossom” bead means “bead that spreads out” so it would seem to me that the original intent was design not squash. But what do I know, I wasn’t around in 1880 when spread beads first appeared. Whichever is the true account, it seems that originally Navajo silversmiths used simple silver bead necklaces to suspend their naja pendants. In about 1880, the tri-petal form that we know as a squash blossom bead appeared. At first, tri-petal silver beads were simply interspersed with plain beads in a naja necklace. Then stones began to be added to the blossom beads partly to please the maker but mostly to satisfy customer demand. While usually associated with Navajo silversmiths, squash blossom necklaces are also made and worn by Pueblo and Zuni people. Zuni necklaces usually feature needlepoint designs. Although there can be any number of squash blossoms on each side of a necklace, there are often six on each side, making twelve squash blossoms and one central naja. Full size squash blossom necklaces are often quite large and heavy and most suitable for occasional ceremonial wear. Smaller, lighter versions are made to be worn as everyday jewelry. Why are there so many squash blossom necklaces around? Demand. During the Native American jewelry boom of the 1970s, the artists made them as fast as they sold. They were one of the most popular Native American jewelry purchases of that time. I have a really unusual squash blossom necklace. I’ve owned it for over 40 years and was told then that the pale turquoise came from a Colorado mine. the metal is pewter. the crown has 5 stones. the stems the stones are out of the beads. I’ve reached a point a have to sell my jewelry so need help identifying the pieces. I’m going to illustrate our conversation with some examples of Vintage Squash Blossom necklaces that are in our Pawn Shop (such as the one above, for example) so as to preserve the privacy of your piece as we chat about it. I’ve received the photos of your necklace that you sent and I shared them with 3 of my colleagues who have been in the Native American Jewelry business for over 150 years collectively !! We’ve never heard of a Native American squash blossom necklace made from pewter. Do you have any recollection as to the name of the mine in Colorado the stones are from? Are there any cracks in the stones? I’m happy you received the photos. What a leading question how much do I want, Well I want as much as I can get. 1st I would like to know who is the artist. 2nd is there away to find the history of the necklace? wife was Navajo For several years I bought lots of goodies. Around 1980 I wore it to the Indian pow wow at the Pomona Fair grounds, and it caused quit a stir was offered up to $1500.00 from different Indians that had selling booths. Of course I said no, it was my savings account. I thought I would try to get between $750.00-to $900. And work down from that. 3rd the jeweler said it was pewter, do you think so it’s verrrry heavy.?? As for which mine, all I remember my husband looked it up and said I don’t think she’s (the store owner) right they had closed that mine in 1902. Also can you suggest books giving silversmith marks? As to who the artist it……I would have no way of knowing the artist. Your best bet is to try to trace the history and artist from the shop or owner you purchased it from. It is a very simple common design that many artists back then used, so it would be difficult to try to attribute it to any one person’s style. The best way to find the history of the necklace is to contact the store where you purchased it. Or if that store is gone, a store nearby that might have been there at the same time. As far as what metal it is made of, I can’t tell definitely from a photo. We have a used Native American jewelry store on our website so we test items daily for their silver content. It is a simple chemical test that any jeweler can do for you. I’d suggest you do that first – take it to a jeweler and ask him or her to tell you if it is sterling silver or has any silver in it. If it has some silver it it, it might be coin silver. If it has no silver in it, then the jeweler might be able to guess what metal it is by seeing it in person. You asked about hallmarks – I didn’t see any silver smith marks on the necklace – are there any? They would usually be stamped on the back of the naja. The store is closed, in fact the whole area is one big mall now. Did you find out anything about the mine? FYI – I sent the close up pic of YOUR squash blossom to a friend who has been in the business for 30-40 years and asked if he thought it could be Dry Creek which is kind of light blue and was the only mine I knew of that produced the pale turquoise…………..here is his reply – do any of those Colorado mine names sound familiar that he mentions? I bought the necklace in May of 1969. And so your friend is probably correct it was new at that time. What do you think the value is? Well, it is like anything else, if you find someone who really wants it, they will pay more than if you just want to sell it quickly. So it might take time to find the right buyer. Here is something that might be helpful for you to do. Go to eBay and do a search for Native American squash blossom necklaces – if you need help on how to do that, let me know. Browse what is FOR SALE now. Then click on Advanced Search and choose the option “Completed listings” and you will see some that are sold (green numbers) some are not sold (red numbers) so you will see what people are asking, what people are actually buying and what auctions close without any bids. The completed listings search is more valuable as it shows if there was any interest in a piece and if so, how much it brought if it sold – or was a NO SALE. You’ve probably also visited our pawn shop and looked at all the squash blossom necklaces we have for sale and sold, right? That will also help you set a price. Thank you very much for your input. Your sites have also been very useful. – they are very nice sites. Peaceful photographs are much appreciated.